Plated materials open unlimited opportunities for product development. V Technical textiles in conjunction with Shieldex Trading USA, offers a wide range of plated textile materials. Flexibility and adhesion enables SHIELDEX metallized fabrics, yarns and fillers to withstand all textile treatments including spinning, weaving, needlefelting and sewing. 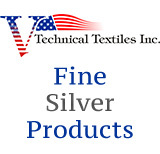 Silver has inherent qualities that make it the idea element to use in applications as varied as medical wound dressings, scent-free textiles, thermal management, conductive tapes, architectural shielding, EMI shielding gaskets, and anti-microbial fabric wipes and linens. Shieldex Trading’s silver-plated fabric, tape, fillers and yarns make all these applications marketable products. Note all prices are by pound unless noted. Minimum order is 1 pound. Also available hobby cones of specified conductive sewing threads. All orders ship within 2-3 business days unless notified.